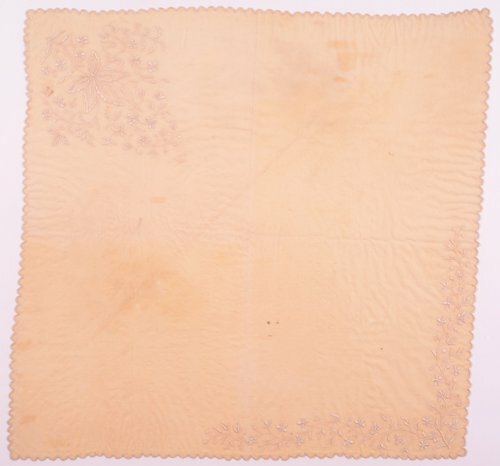 Baby's off-white wool shawl with a hand-embroidered floral decoration in two corners. Emily (Stephens) Grinter embroidered the shawl around 1896 or 1897. She was born in New York in 1833 and married Thomas A. Grinter in 1865. The couple lived in Wyandotte County, Kansas. Thomas was the cousin of Moses Grinter, who operated a trading post and ferry on the Kansas River in Wyandotte County. The date of the shawl suggests that Emily might have made this for one of her grandchildren.